The Media Library is where you will upload all images, PDFs, other allowed file types. Within the library, you can then add descriptions and captions to your files. File types allowed for upload are: jpg, jpeg, png, gif, mp3, mov, avi, wmv, midi, mid, pdf, doc, docx, ppt, pptx, xls, xlsx, flv, mp4, swf, mpg, zip, sas, txt, ics, and webm. It’s important to know that all image files in the Media Library should have the Alt Text field completed with a description of the file. The Alt Text is used by visitors with visual impairments that use a screen reading browser to navigate the internet. Leaving the Alt Text field empty means that visitor will not know what image was posted and thus, the site is not accessible. As a public University and Academic Health Center, we should always strive to have accessible content for our site visitors. To add an image or other media click on Media in the Dashboard Navigation Menu, then click on Add New. For media that is located on your computer click on the Upload Files tab and then Select Files. Choose the image files you want to upload. Add Alt text – Alternate (Alt) text is very important for accessibility. A visually impaired visitor using a screen reading browser will not know what the image is of unless you describe it in the Alt Text field. This is also used for SEO. 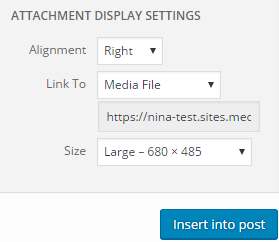 The Alignment and Size for images can be chosen at this point or later on in the page building process. Alignment will place your image on the Left, Right, or Center of your page. Left or Right alignment will cause the text to wrap around your image. The choice of “None” places the image on the left by default and does not create text wrap. When ready, click on Insert into Post. The Link To option allows you to link the image as seen on the webpage to a larger version of the image (Media File), to another area of the site or page (Attachment Page), or an external URL (Custom URL). To add video to your page or post, simply copy and paste the video’s URL into the Rich Text Editor and click Update. The website will automatically embed the video on its own.